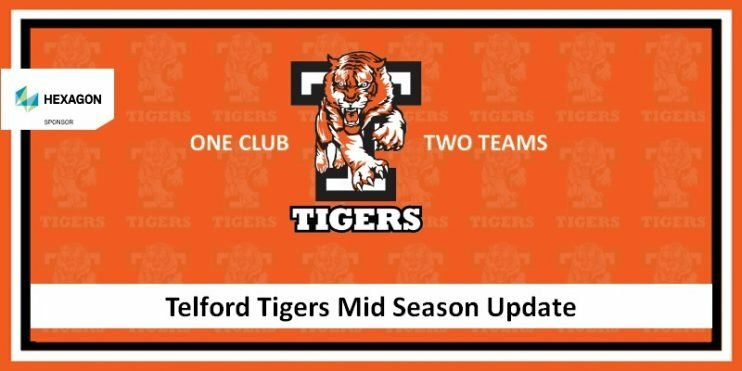 We managed to catch up with General Manager and Head Coach of the Hexagon sponsored Telford Tigers late last week to get a mid season update. Tom had the following to say “Of course it’s another busy and exciting season of Telford Tigers Ice Hockey but none of what we have done over the last two seasons would be possible without the support of our sponsors, loyal fans and fantastic match night volunteers. The Tigers have a long history and enjoyed several championships with the first taking place in 1985, we have had 5 championship pendants installed for all of the clubs major on ice achievements along with one for the Junior Club which now hang from the rafters in the ice rink. This is a great reminder and acknowledgment to all the players and fans of the past success of this club. We currently have two teams competing in their respective divisions with the D2 team currently sitting in second place in the league behind leaders Widnes Wild but have a game in hand and with a stunning victory in a very tight game against the league leaders last weekend the margin was narrowed. The target for the D2 team this season is a playoff place which will see them feature in the playoff finals, final four. With season ticket holders also benefiting from entry to D2 fixtures they are enjoying some great crowds and atmospheres. The D1 team are currently sitting in first place of the Moralee Division, with a small advantage of 1 point separating us from second place Sheffield Steeldogs and two points from third place Hull Pirates, all having played 25 games in the league and with several games still to play against the Steeldogs and Pirates there is sure to be an exciting finish to the league schedule. Last weekend saw us take a break from league action and play the Semi Final of the North Cup in back to back games with the Solway Sharks in aggregate score format, following a closely fought couple of games we are now looking forward to meeting Sheffield in the final soon. This season we began filming all D1 fixtures and have created our very own YouTube channel to show match highlights. This has been a work in progress which we are developing further with the quality of the package improving week on week, which is all overseen by 15 year old Christian Harrington. This is an excellent coaching aid for myself, but also provides further exposure for our sponsors. We currently have over 230 subscribers which continue to increase each week as do our all our social media platforms, where we are achieving very high numbers of interactions plus excellent photographic articles in the Shropshire Star on a weekly basis. We have some enjoyed some great games this season and some excellent attendances with the D1 fixtures on the 23rd & 30th of December very close to being sell outs. We continue to enjoy a great interaction with local schools, offering complimentary tickets to pupils and staff to attend a game as our guests, with 17 primary and comprehensive schools enjoying the Tigers games this season. We worked extremely hard through the summer attending many events to raise the profile of the Tigers in the off season and with the support of our partners Shropshire Festivals, we have been lucky enough to be part of the Shrewsbury Kids Fest and Shrewsbury Food Festival and with the purchase of our Interactive Hockey Goal we have had a brilliant impact and interaction with kids which in turn has promoted our beginners ice hockey Learn to Play program. This is great chance for kids to try hockey and take up the sport progressing through the Tigers junior club to the senior Tigers. We are very keen to develop local talent and with our Under 18’s being crowned National Champions last season we are fortunate to be developing some of the best young players in the country as prospect players with both the Tigers D1 & D2 teams. Off the ice and away from the rink we pride ourselves in supporting the community where we can, after all the community has supported the Tigers for over 30 years! I think all of Telford came together to support young Zac Oliver in his families quest to raise much needed funds for medical treatment. The club, Tigers fans and the Swindon Wildcats (who donated all funds from their chuck a puck competition) raised in the region of £1k. In early December we held our annual Teddy Bear Toss where fans bring a new Teddy Bear and throw onto the ice when the Tigers score their first goal, with all teddies being donated to the Children’s Ward at the Princess Royal Hospital. Several players and Roary the Tiger attended the hospital to spread some Christmas cheer and invite the children and families along to a Tigers game in the future. Early in the new year the club held a food drive in aid of Telford Crisis Support with hundreds of foods and healthcare items being donated and distributed into the local community. We have recently created the Roar Club for fans who will be in with the chance of winning some very special prizes in our monthly draw plus discounted travel and entrance to Roar Club events. With the Cricket Day, Quiz Night and Race Night all behind us we are looking forward to the return of the Ladies Night on February 21st at Casey Bar and Tigers Awards Evening which will take place in April. Our relationships with other local sports club continues to grow as we work closely with Wolves Speedway and also Walsall FC Community Programme where we regularly attend the schools engagement games. With the continued support of Telford Ice Rink we are looking forward to improved signage internally and externally at the Ice Rink which will help raise our profile in the Southwater area and with all the seating planned to be replaced in the post season there are some very positive changes ahead. Hexagon Telford Tigers 1 return to play at Telford Ice Rink Sunday 10th February 2019 at 18:00 in the NIHL Moralee Conference against Solway Sharks. Hexagon Telford Tigers 2 are next in home action at Telford Ice Rink on Saturday 9th February 2019 at 19:00 in the NIHL Laidler Conference against Coventry Blaze NIHL. For details of all future fixtures, check out the Tigers fixture list and www.telfordtigers.net/tickets for ticket information.